Featuring 70 hand-crafted costumes from the first six blockbuster Star Wars films, this exhibition reveals the artists’ creative process—and uncovers the connection between character and costume. George Lucas imagined and created a fantastical world filled with dynamic characters who told the timeless story of the hero’s journey. The costumes shaped the identities of these now famous characters, from the menacing black mask of Darth Vader and the gilded suit of C-3PO, to the lavish royal gowns of Queen Amidala and a bikini worn by Princess Leia when enslaved by Jabba the Hutt. A special presentation for the showing at Discovery Times Square in New York will feature seven additional costumes from the highly anticipated film, Star Wars: The Force Awakens. Taking place at Discovery Times Square on Saturday from 10:00AM to 9:00PM and Sunday from 10:00AM to 7:00PM. Adult tickets cost $27.50 and tickets for children ages 3-11 cost $20. 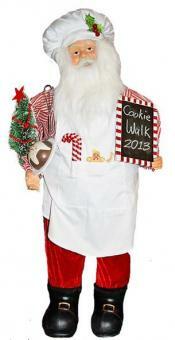 As you enter the Cookie Walk, you will be greeted with the smell of baking cookies made from only the best ingredients. They have been baking non-stop for days so that tens of thousands of fresh baked cookies await you. Take a walk through the Cookie Wonderland and fill a box with your favorites from over fifty varieties of homemade confections. There are two sizes of boxes: $15 & $25 plus special Gluten Free options at their yummy Hot Chocolate Bar. After the last cookie is packed, be sure to visit Tinseltown a holiday gift market for everyone on your list. At their Little Elves Bakery & Workshop, children 10 and under can create their own sweet masterpiece to take home – no charge except to have fun! Santa will also visit through the day for pictures at their awesome Photo Booth. Come early Saturday for the best selection of cookies! Taking place at the St. Nicholas of Myra Church on Saturday from 11:00AM to 5:00PM and on Sunday from 12:00PM to 3:00PM. Admission is free, cookie prices vary. Drop by this weekend to create your own gifts and holiday decorations inspired by the gardens and galleries at Wave Hill. There are three different gift making workshops. Felted Soaps, Natural Wreaths and Swags and Miniature Arrangements. To make the soaps the cost is $18 or $10 for Wave Hill members. To make the wreaths as well as the mini arrangements the cost is $30 or $20 for Wave Hill members. Creating your own gifts is welcome to children ages 8 and up accompanied by an adult from 11:00AM to 3:00PM on Saturday and Sunday. Also taking place at Wave Hill is a family art project: Candles, Snowflakes & Stars. Kids can take a simple candlestick and using colorful, clay-like wax, mix and mold an inventive image of nature onto a candle, or make a woven string star or symmetrical button snowflake at this fun, seasonal bazaar. This event takes place from 10:00AM to 1:00PM on Saturday and Sunday. Admission to the grounds is free on Saturday until noon. On Sunday admission costs apply. All aboard! Holiday Express is sure to amaze and delight kids and kids at heart for hours on end. This weekend, bring the whole family to explore this holiday exhibition! While you’re there, don’t forget to pick up a special train scavenger hunt; sit down to make a train car of your very own; and move, giggle, and laugh out loud with Conductor Abe! Taking place at the DiMenna Children's History Museum (New-York Historical Society) on Saturday and Sunday from 11:00AM to 3:00PM. This event is free with museum admission. Conceived in 2007, Rennie Harris Awe-inspiring Works (RHAW) is a youth organization driven by community outreach, education, classes, and mentorship. Harris's founding inspiration for this youth driven company was motivated by the overwhelming interest from teens and young adults to join his internationally renowned company, Rennie Harris Puremovement. Ultimately, RHAW teaches its dancers professionalism, production, street dance history, and technique in various styles of street dance. Downplaying the abstract while pushing its dramatic aesthetic, RHAW forges new paths for young hip hop hopefuls and presents hip hop in its "RHAW-est." form, taking it back to basics. Come see the show this Saturday at 11:00AM at Symphony Space. Tickets cost $15, and $13 for members. There are two Star Wars events happening this Saturday at the Brooklyn Library. Meet denizens of the Star Wars Universe! This interactive program will encourage reading, physical activity, creativity, and, of course, a love for all things Star Wars! Activities will include a Mandalorian Mercs Boot Camp, and a Empire Saber Guild Lightsaber Training from Jedi Masters. Don't forget to bring your camera along for special photo ops. This event is taking place from 1:00PM to 3:00PM. Also taking place at the library is a creative workshop. Star Wars fans can journey with artist David Alicea and create their own Jedi Knight along with companion Droids, plus more! This event takes place on Saturday from 11:00AM to 12:00PM. *Both events are free to attend and take place at the Central Library Branch in Brooklyn. Three vibrant New York City–based artists perform in My City, My Song, a colorful, interactive concert that provides an opportunity for kids to learn about New York City’s diverse musical and cultural traditions. Athens-born pianist, accordionist, and singer Magda Giannikou performs exuberant music rooted in Greek traditions. Indian singer Falu Shah blends Eastern and Western music into a unique “Indie-Hindi” style. Kora player and singer Yacouba Sissoko shares stories and songs from his native Mali. Taking place at Carnegie Hall on Saturday at 12:00PM. Tickets are free, an RSVP is required. There is limited availability. For tickets please call Carnegie Charge at 212-247-7800. Join the Peanuts gang again this year and help celebrate their 8th anniversary in their brand new venue, Redwood Studios in Brooklyn. They'll be performing the classic Charlie Brown Christmas Special word for word and gesture for gesture set to a jazz trio performing the amazing Vince Guaraldi score. Taking place on Saturday and Sunday at 1:00PM, 4:00PM and 7:00PM at Redwood Studios. Tickets cost $12. Tickets are available at the door but buying in advance is strongly recommended. Join in for an afternoon of holiday creativity and fun as you create reindeer ornaments from pinecones, beautiful snowflakes out of paper, cinnamon and clove pomanders, and tin can luminaries using recycled cans. The crafting fun takes place at Greenbelt Nature Center in Staten Island on Saturday at 1:00PM. The cost is $12 for this event. The fee per craft participant is $10 for Greenbelt Conservancy members; and $12 for non-members. Registration and pre-payment is needed for this event. Creatively blending theater arts with the wonders of scientific exploration, Doktor Kaboom! keeps his crowds riveted with interest and rolling with laughter. Join Kaboom! for a sidesplitting journey of increasingly spectacular (and often successful) science experiments designed to involve, excite and entertain. If science and magic are the same thing, then Santa must be the greatest scientist in the world! Doktor Kaboom tries to figure out how Santa does all those wonderful things he does, in this hilarious holiday event! Ticket holders to this event are invited to take a photo with Santa and Mrs. Claus following the performance. Taking place at the Tribeca Performing Arts Center on Saturday at 1:30PM. Tickets cost $25. Composer Phil Kline will lead a massive chorus of boomboxes from the West Village to the East Village in the 24th annual holiday presentation of Unsilent Night. People gather at the arch in Washington Square Park, and less than an hour and mile later, end up in Tompkins Square Park. Phil Kline will hand out a limited number of vintage boomboxes from his collection and cassettes and CD’s for those who bring their own. The public is strongly encouraged to bring their own boomboxes or sound-blasters, and to pre-download the track. Meet in Washington Square Park at 6:45PM on Saturday. This event is free to enjoy. Join in the second annual Chanukah art experience at the Jewish Children’s Museum in Brooklyn. Learn about the ancient art of oil-pressing in an interactive Olive Pressing workshop, customize a Donut, create your own bead design to add to their giant Dazzling Menorah, and experiment with vibrant ink and customizable stencils at their Silk-Screening workshop. You can take part in live game shows and in their Grand Menorah Lighting, where children can meet the ancient hero, Judah Maccabee. Taking place on Sunday from 10:00AM to 4:00PM. Tickets are $13. Hundreds of tenor and bass tuba players will congregate on The Rink at Rockefeller Center to play Christmas carols and other crowd favorites. Tubists of all ages will line up under the famous Christmas tree and fill the plaza with the organ-line sound of low brass. Spectators are encouraged to sing along with the Christmas carols and holiday favorites. The musicians, hailing from across the country, will be conducted by Chris Wilhjelm, conductor of the famous Goldman band. Conceived by tuba virtuoso Harvey Phillips to honor his teacher, the late William J. Bell (Born Christmas Day, 1902), the first Tuba Christmas was presented at Rockefeller Center in 1974, conducted by Paul LaValle, of Band of America fame. This unusual Christmas tradition is firmly established in over 200 cities around the world. Taking place on Sunday at 3:30PM. It is free to enjoy this event. Join a magical family tradition! The Christmas Show at the St. George Theatre is a two-hour, high energy, rhinestone-studded series of songs and dances. The production includes such popular tunes as “We Need a Little Christmas,” “Let it Snow” and “Silver Bells” as well as spiritual numbers including “O Holy Night” and “Go Tell It on the Mountain.” Enjoy scenes from the North Pole to Time Square, Clove Lakes Park, Lorenzo’s Cabaret, to the historic St. George Theatre. Meet & Greet the cast in the grand lobby following the performance, don't forget to bring your camera. Taking place at the St. George Theatre in Staten Island on Saturday and Sunday at 3:00PM and 7:00PM. Tickets cost $45, $25 and $15. There is also a Sunday night special, all tickets cost $20 and $10. Dress Up, Dreidel Down Hanukkah Disco Party! Dress to impress at the Jewish Museum's very first Hanukkah Disco! Make your red carpet entrance, catch the daytime dance fever and kick off the last night of Hanukkah with latkes, mocktails, DJ, art, and more! For grandparents, parents, and children ages 2–tweens (children under 2 are free). Featuring 9-year old DJ Alden of CirKiz. Plus: Walk the Red Carpet, Glitter Tattoo New York, Todd Neufeld's Twisted Balloon Company, and Family Photos. Taking place on Sunday from 3:00PM to 5:00PM at The Jewish Museum. Individual tickets cost $48, a family package costs $218.